Baking is a form of art and requires the right tools to make your imagination go wild. Whether you bake for fun or a professional cook, you need to pick the right bakeware sets to make the activity fun and exciting. Maybe your kid is having a birthday party, and you want to serve a fairytale cake, chocolate chip cookies, sparkling cupcakes, and more. 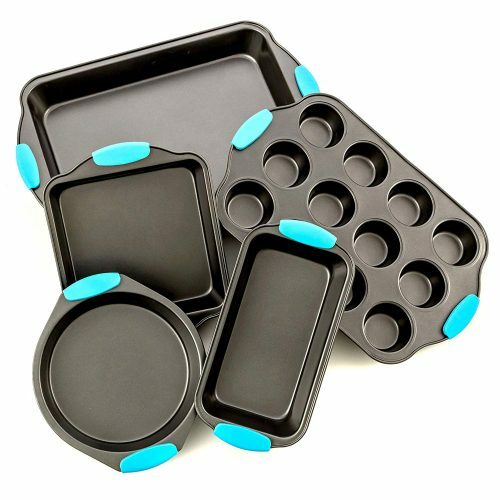 Pick one of the top 10 best bakeware sets to achieve the best results. No matter what form of baking you want to do, these baking essentials will sure come in handy. With the next 5-piece bakeware set, you can make anything in the oven by using your imagination. The pan set has a nonstick structure for treats to slide of with ease. 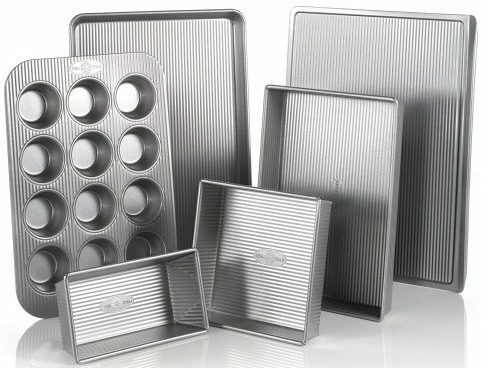 Included in the kit, you receive a Pie Pan, Square Cake Pan, Bread Pan, and Baking Pan. The majority of the cookware has a rectangular shape and has a gorgeous finish with silicon grip handles. Included in the 5-piece bakeware set from Rachael Ray you get a 10 x 15-inch cookie pan that is perfect for using every day. You can even use it to prepare meatballs in the oven. The nonstick interior prevents bakes from sticking, and the exterior is dishwasher safe. With the wide handles, you get a comfortable grasp without dropping the pan. 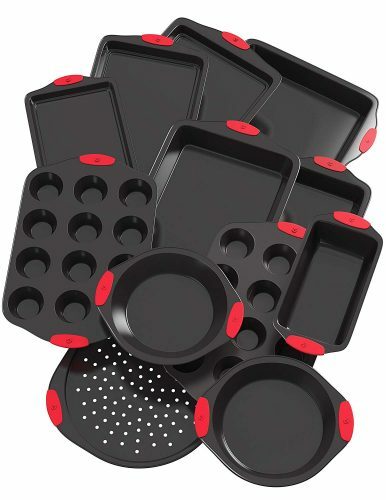 For the best bakeware set made for any baking needs get your hand on the 12-piece Vremi set. The whole kit has carbon steel with nonstick construction. The silicone handles are red and prevent you from burning your hands. The collection includes all the essential baking pans with round shaped cake pans. The beautiful copper bakeware set from Gotham Steel looks great in any kitchen. All the pans are nonstick and scratch-resistant to use with metal utensils. Included is a large baking sheet that is perfect for making pizza and other delicious treats. You get a twelve-muffin tray and loaf pan as well. Then there is a square baking pan and round cake pan. 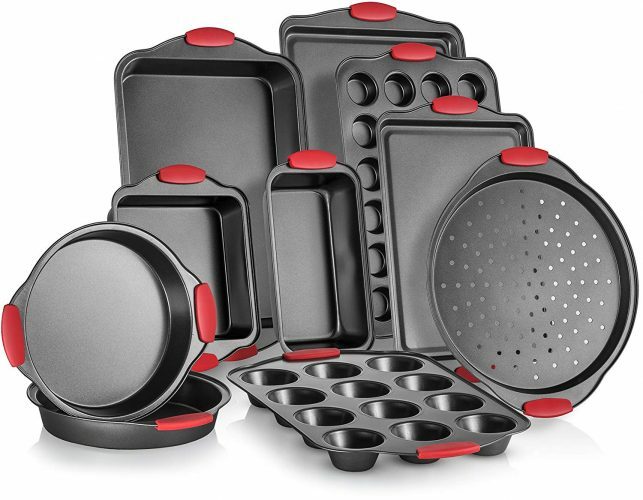 With the 10-piece bakeware set available from Perlli, you can make delicious muffins, fresh pizza, brownie cake, and so much more. The pans made with a nonstick and carbon steel structure. To move the trays from the oven to the cooling rack it has red silicone handles that is cool to touch. You can use it in the microwave, stove, and refrigerator. 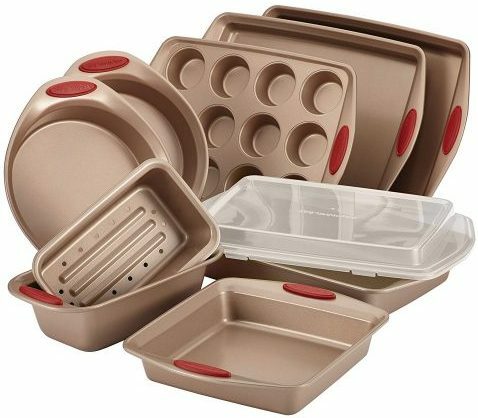 No matter what your baking or roasting needs are the 10-piece bakeware set from Rachael Ray is here to help. The nonstick and carbon steel design is ready to use anytime. The modern-rustic color fits in with any kitchen décor to add comfort and style when baking. The handles generously made to provide a comfortable grip and the pans easy to clean. The 6-piece USA Pan Bakeware Set includes everything you need to prepare delicious oven treats. The construction of the pans is aluminized steel and has a unique fluted design. The structure helps improve the nonstick qualities of bakes to prevent it from sticking to the pan. 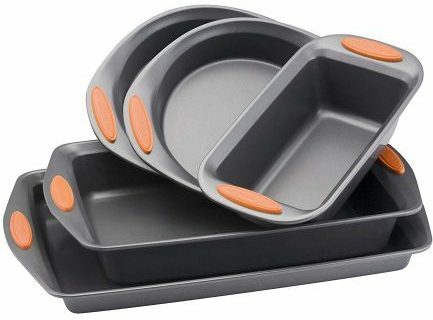 The Circulon bakeware set is a reliable collection to prepare any of your favorite recipes in the oven. The baking surface has raised circles and coated with premium-quality nonstick. The pans have rolled rims and wide handles that are comfortable even when using large oven mitts. You get everything you need to bake cakes, cookies, meat loaves, muffins, and so much more. 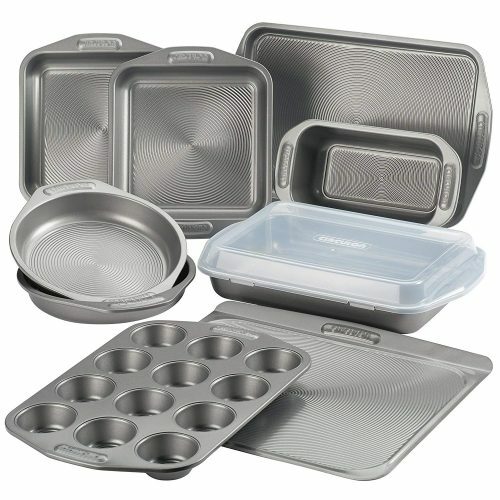 For the best bakeware set on the list, you need the Calphalon collection with everything you need to start baking. The versatile kit is functional and comes with interlocking nonstick layers for performance. 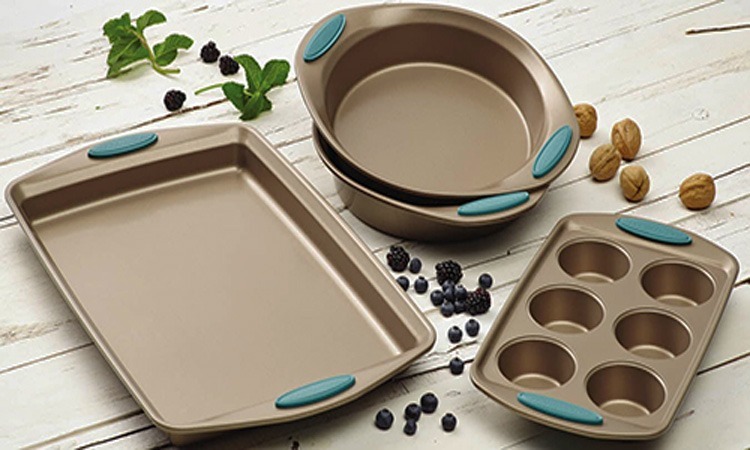 The steel core in each baking sheet and pan helps distribute heat and is dishwasher safe. 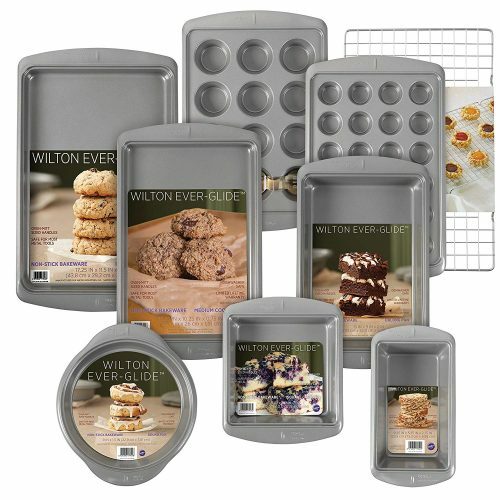 The following bakeware set from Wilton has a nonstick surface to help improve baking. The oversized handles sit comfortably in the hand when moving it from the oven to the cooling rack. You can use it with metal utensils, and it is dishwasher safe. Included is everything you need to start baking delicious treats for the family. Do you want to bake delicious treats for the home? 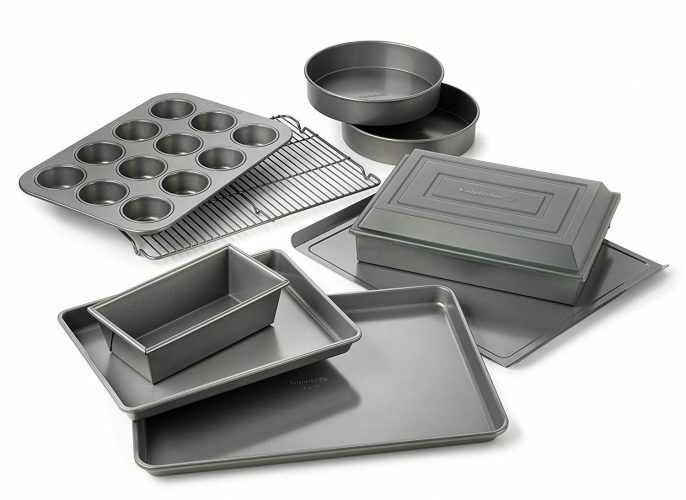 The top 10 bakeware sets reviewed can help you get started. Each of the kitchenware displayed has a durable construction with a nonstick coating. 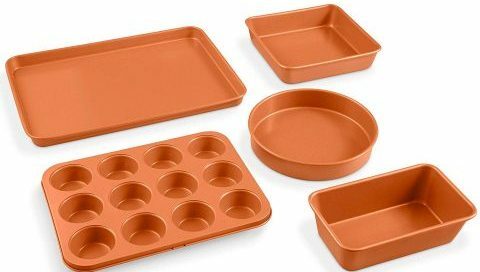 Whether you are starting out a new home or settled for years, the bakeware sets are perfect to use in any kitchen.